RPM Real Estate Group, Victoria’s leading sales agency servicing the residential development industry, shares its insights into Melbourne’s property market across development sites, new communities and apartments and townhouses. This article is taken from RPM’s Residential Market Review Q2 Report. With retail lot price growth moderating over the last six months, there is a pronounced ‘flight to quality’ by developers who are seeking quality development sites in peri-urban areas to meet growing demand from increasingly price sensitive buyers. Given the premium for developable land from a transaction perspective, developers are applying more creative structures such as adjustments to purchase terms or deposit amounts to meet vendor expectations. There’s also a new breed of purchaser in the market: speculative investors, who are driving more activity in the nomination space. These investors who have secured a site on terms are now looking to on-sell it. This is most likely because they see a plateau in growth and want to realise the uplift now without settling. The ‘flight to quality’ is also evident in Melbourne’s urban infill market, with local and offshore groups seeking to secure prime development opportunities as they pivot their product towards owner occupiers. There has been a shift away from permit approved and ‘ready to go’ projects to larger ‘raw land’ holdings, with groups also looking to take on planning and rezoning for the right opportunity. Current market conditions are ‘flushing out’ non-professional developers. Banks are undertaking robust due diligence with developers having to ensure their developments ‘truly work’. The prominence of owner occupiers has resulted in lower volume, higher priced projects in blue chip suburbs, featuring high quality design, space, security and amenity. The past six months has seen a reversal in the trend of gross lot sales outpacing new lot releases, relieving some of the supply and price pressures built up over the previous two and a half years. As a result, lot price growth fell from 26% in the March quarter this year, to 19% for the June quarter. This is reflected in a continuing price correction, with the median lot price marginally increasing 0.6% to $325,000 for the June quarter from the previous quarter, which is the lowest quarterly growth rate in three years. With prices having peaked there has been a shift in buyer demand to more affordable locations. New housing demand through the growth corridors remains the strongest in the Western corridor, which recorded 2,310 lot sales in June quarter 2018, accounting for 46% of total lot sales. Sales activity in the west is underpinned by an abundance of supply, with the corridor’s 56 active estates offering greater diversity in price, lot size and location for buyers compared to other growth corridors. In the June quarter Melton and Moorabool experienced substantial annual median lot price growth of 33% and 54% respectively, but remain relatively less expensive compared to other areas, with Melton’s median lot price sitting at $300,000 and $234,000 for Moorabool. The Northern growth corridor recorded 1,126 lot sales in the June quarter, comprising 22% of total lot sales. Deteriorating lot supply in Hume resulted in lot sales continuing to weaken in June quarter 2018 and an increase in lot prices by 7.9% from March quarter 2018. 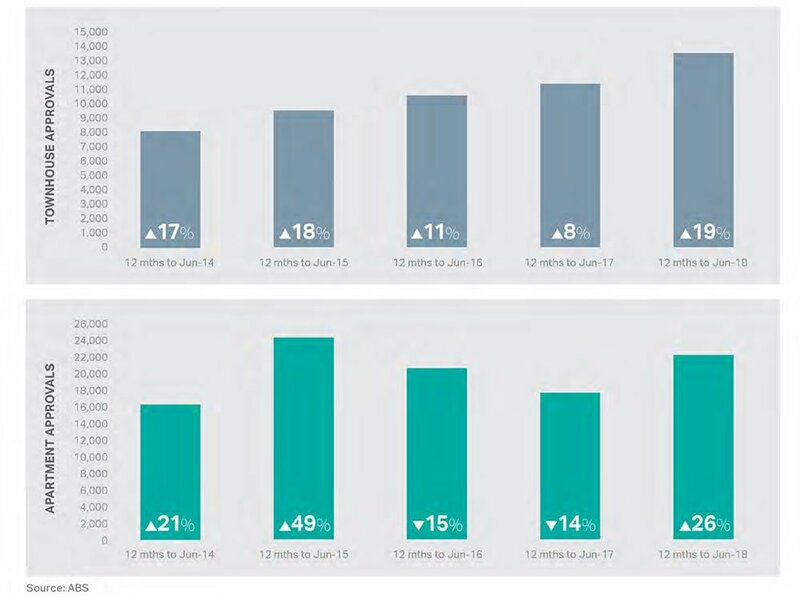 Conversely, Whittlesea added 4 new estates during June quarter 2018, with the subsequent increase in new lot supply keeping lot prices stable and underpinning lot sales activity. The recently completed PSPs of Wollert and Donnybrook/Woodstock facilitated the addition of new estates in Whittlesea. The PSPs of Lindum Vale, Lancefield Road, and Sunbury South await approval. Sales activity was relatively stagnant across the South East growth corridor, which recorded 828 lot sales from 35 active estates in the June quarter 2018, equating to 17% of total lot sales. Casey has the most expensive median lot price compared to new lot supply, which suggests that lot sales activity is constrained by affordability. Whereas in Cardinia, lot sales are restricted by both affordability concerns and limited lot supply. The soon to be approved PSPs of McPherson and Minta Farm in Casey, along with Pakenham East in Cardinia should also alleviate some supply and affordability concerns by keeping lot prices steady. 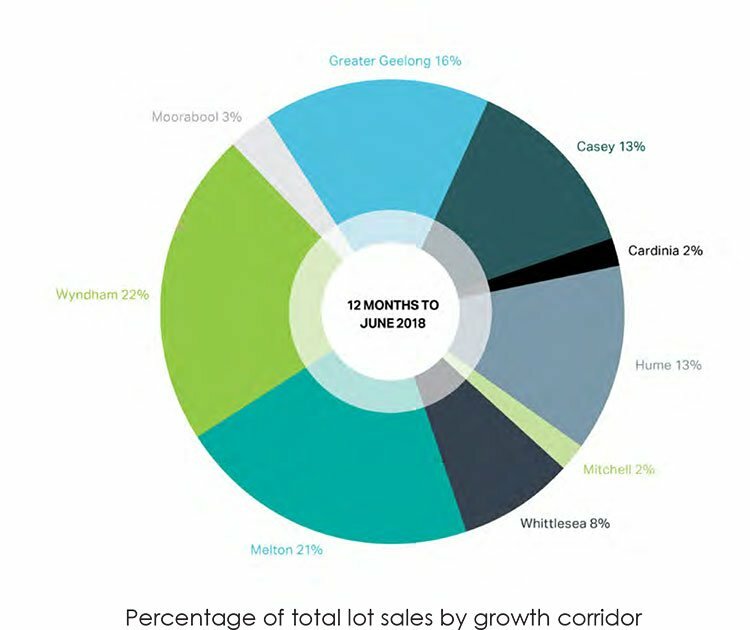 The Greater Geelong growth corridor accounted for 15% of total lot sales in June quarter 2018. Lot sales activity has held up in this region, with the June quarter almost identical to the corresponding figure 12 months earlier. Notably, there were 8 fewer active estates over these periods. Activity in the apartment and townhouse market remains solid, despite restrictive lending and regulatory policies. On a rolling 12-month period to June quarter 2018, other dwelling approvals (apartments and townhouses) increased 23% to 35,789 from a year earlier. From the peak over the 2015 calendar year, the decline in apartment approvals has moderated, while townhouse approvals have trended upwards. On a rolling 12-month basis to June 2018, apartments have increased 26% while townhouses have climbed 19%. For the June quarter 2018, townhouse approvals increased by 18% while apartment approvals fell 38% from the March quarter. The restrictive nature of bank lending to investors and owner occupiers has placed a ceiling on price growth. This is reflective in the June quarter with an increase of only 0.5% to $604,000 from the March quarter, and a modest gain of 0.3% when compared to the June quarter last year. More affordable suburbs have driven the price side in recent quarters, including what would be considered less traditional apartment market suburbs such as St Albans and Reservoir. These two suburbs have seen apartment prices rise by 48% and 56% respectively over the past five years. These locations, though not seen as typical medium/high density suburbs, offer good infrastructure, amenity and proximity to the CBD. Prices in inner suburbs, such as Collingwood, Abbotsford and West Footscray have fallen by between 2% to 5% when compared to peak prices five years earlier, due to excessive off the plan apartment sales now fetching lower resale prices and the current restrictive measures imposed by banks on funding to new borrowers. The rental market remains below the satisfactory supply level of 3%, with the inner ring (1.8%), middle ring (2.4%) and outer ring (1.9%) all sitting below the balanced level. The acute level of supply has underpinned the gains in rental yields. The key driver for all dwelling types is population growth – particularly overseas arrivals. There has, however, been growing discussion at the federal level of placing a cap on intake numbers. Investor demand for residential property will stay subdued, largely because of APRA’s macro-prudential measures designed to curtail investor lending. Despite the removal of the annual growth cap on investor loans, APRA will further regulate the quality of loans. This will continue over the near term on the back of a tightening of negative gearing and removal of stamp duty concessions for off the plan property. The more affordable suburbs in the middle and outer rings should offer long term growth, however we don’t anticipate growth in the near term given tighter credit conditions.